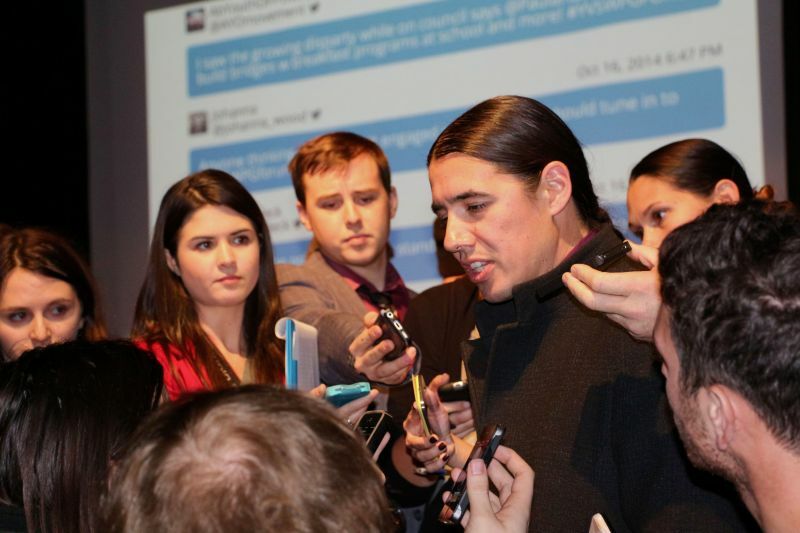 This Wednesday, I’m voting for Robert-Falcon Ouellette. I believe he offers the best combination of progressive ideas and personal characteristics of all the candidates. Having voted in every Winnipeg civic, provincial and federal election since the 1970s I’ll go even further – Robert is the most promising candidate for mayor (or any other office) we have seen in a generation. Robert proposes sensible ideas for fixing Winnipeg’s infrastructure and knows how we’ll pay for them. His plan to renew Winnipeg Transit is both practical and visionary. His proposals for standing up for indigenous women and girls will save lives. He’s serious about cleaning up City Hall and he walks the talk: unlike his competitors, he lists his contributors on his web site, in real time. As a grandfather, I’m pleased with his many creative ideas for a child friendly city and for a city our grandchildren will thank us for when they are old enough to vote. There’s much more I could say about Robert’s platform. Visit his web site (links below) and judge for yourself. While I have your attention, I’d prefer to talk about Robert the man. Born on Red Pheasant Cree Nation in Saskatchewan, Robert grew up poor. His father suffered from alcoholism. He’s been hungry and homeless and knows what it is like to live on next to nothing. Statistically speaking, he should be dead, in jail or poor. Instead, Robert has defied the statistics that come with being born aboriginal and poor in Canada. At 37, he directs Aboriginal Focus Programs at the University of Manitoba. He, his wife Catherine, and their five children live in a comfortable home. During 18 years in the Canadian Forces he earned a Bachelor of Education degree, two Masters degrees (music and education) and a PhD in educational anthropology. Robert credits his success to his mother’s sacrifices and the support he received from a high school teacher. However, without his own considerable intelligence, hard work and self discipline he would not have come this far. Robert is youthful and energetic, but thoughtful and mature. He’s self confident, yet modest. He’s self-aware but not self-absorbed; without exception, he treats everyone with genuine interest, respect and warmth. He communicates fluently in English, French and Cree. He likes to laugh, dances a pretty good Red River jig, sings on key and plays a mean piano. Robert says he wants to be “a mayor for everyone.” Not content with cleaning up City Hall, he aspires to unite a city that is divided along racial, ethnic and class lines. This is a tall order, but if anyone can, it’s Robert-Falcon Ouellette. A poll came out this morning that puts Robert in third place with the support of 14% of decided voters. This is a remarkable achievement for a candidate who was completely unknown when he declared his candidacy in late May. The two front-runners, Brian Bowman and Judy Wasylycia-Leis, are in a statistical dead heat with 38 and 36 percent of the decided vote respectively. With 29% of those polled in the undecided category, this race is too close to call. I don’t accept these arguments. For starters, a careful analysis of the front-runners’ programs reveals no significant differences. Neither candidate promises the break with the past we need for Winnipeggers to meet the many challenges we face. Neither candidate has demonstrated the skills or attitudes needed to unite a divided city. One is as good or as bad as the other. My philosophy is simple: You get what you vote for. The only sensible thing to do is to vote for what you really want. For me that means voting for Robert-Falcon Ouellette. If Robert wins, great! If he doesn’t, his ideas will have to be taken seriously, especially if he attracts a significant share of the ballots cast on Wednesday. These votes will provide the foundation, not only for future campaigns, but for the movement for real change that must be built and sustained far into the future.